Please note that our April meeting has been moved to April 14th due to the Easter weekend holiday. Hope to see you then. It happens every year. My parents moved to Florida in 1969, and I have gone there ever since for Christmas break except twice. Once, we stayed home and didn’t like it, and this past December we drove to Austin, Texas to spend the holidays with my daughter, her husband, and our two-year old grandson. We had a marvelous time playing trucks, cooking together, and running around the table chasing. We also spent three days in San Antonio walking the Riverwalk, eating Tex-Mex, and visiting the old missions including the Alamo. Wonderful historic places. We came home after driving two days into a snowstorm for the last 1 ½ hours and were glad to be back home in our own bed, bathroom, and kitchen. Not necessarily in that order! The next morning, my husband goes off to work at his office, and I have this feeling of “what do I do now.” What do I feel like doing? Well, it wasn’t any art work or lettering. Somehow, every year, it takes me a couple of weeks to get back into the need to go up to my art room and create or just letter some words. Nope, nada, nothing. My energy was spent getting out the Christmas cards, wrapping presents, baking cookies, and lettering a recipe for the guild exchange before my deadline of December 16 before we left for the southwest. I piddled around the house doing the usual…dishes, laundry, ironing…but spent the afternoons reading, playing on the ipad, or writing e-mails. I retired in December from my job as an elementary secretary, and it crossed my mind that I wouldn’t be able to keep myself busy all winter. One morning, when I was in the kitchen, I received a text from my son-in-law from Dayton, Ohio who was in New York at a conference. He asked, “Would you do me a favor.” Now, I’m from New Jersey, and we didn’t trust anyone who asked this question! I asked, “What do you need.” The text I received next was a surprise…could I please write out in calligraphy two of his favorite quotes. “I am the master of my fate, I am the captain of my soul” and “It always seems impossible until it is done.” I was honored to have him ask. So, finally, there was inspiration and motivation to work on something and do some lettering and layout. Since then, I have lettered every day, spent several afternoons working on my 9-year old granddaughter’s quilt, cleaning out closets and spent a whole day making English muffins. Finally, I was back in the swing. Hopefully you are all motivated and inspired to do some lettering and practicing and maybe even complete a finished piece to bring to the guild meetings for show and tell. 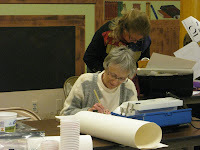 January 2012 was an exciting meeting with 14 members joining us, including one visitor, Connie Wendt, whom we met at Arts Café in November. Connie is the German Star queen, and we enjoyed having her at our meeting. We went around the table introducing ourselves, and I am encouraged about the members that have only been with us for a year or less……and we still have some members that have been with us since the guild’s inception, almost 20 years ago. At this first meeting of the year, Diana Stamper gave a demo on cut out letters and, following her instructions, we were all able to create a small prototype of a name or word that we drew on our papers. Thanks Diana. Our February meeting was fabulous. 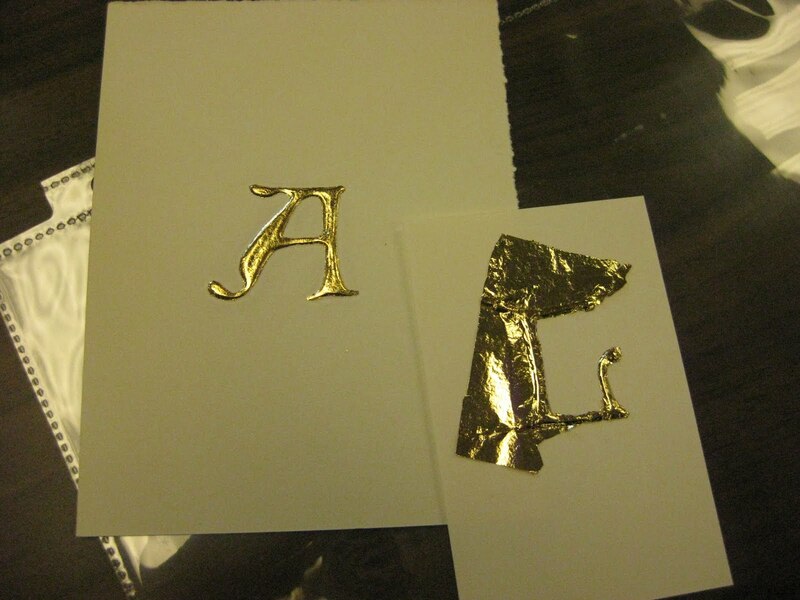 Amber began by starting her demo on gilding a letter. She did a wonderful job, and we all had a little gold gilded heart to take home as a token. Thank you so much Amber for your demo, printing out the instructions and a sheet of letters for us to work on. It was so much fun. After our meeting and at the end of Show and Tell, Connie, our newest member and German Star guru, brought a box full of her stars and some paper. She said if anyone wanted to learn how to do them, she would be willing to show us. So, I asked if she wanted to do it right then and there, and she agreed. When we were done attempting to make a Star, we all decided that what she charges for her work is not high enough!!!! Thanks Connie for doing an impromptu demo for us. It was great! 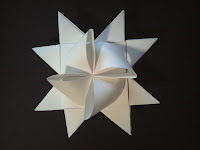 Jacqueline Sullivan will be teaching a class on Saturday, April 28 and Sunday, April 29, 2012. 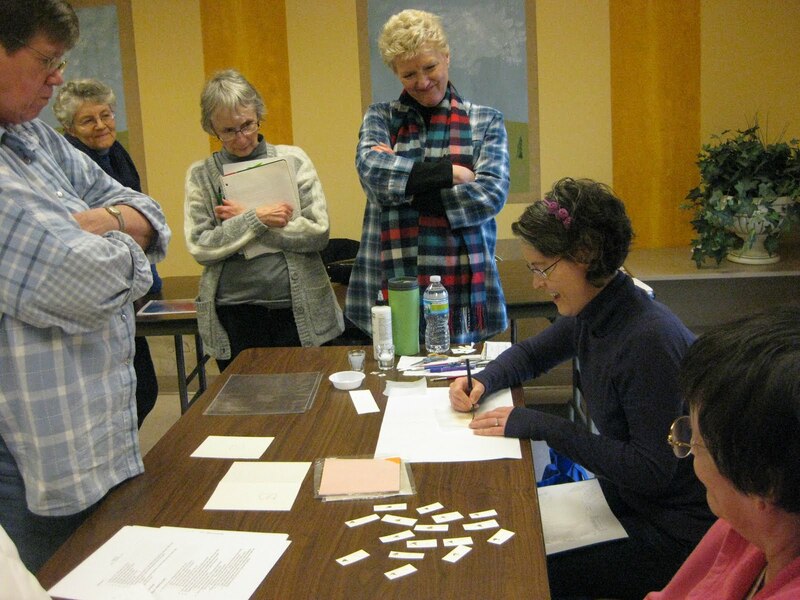 The title of Jacqueline’s workshop will be "Visual Poetry," encouraging students to use words only as part of an abstract painting and not as a foreground/background thing. 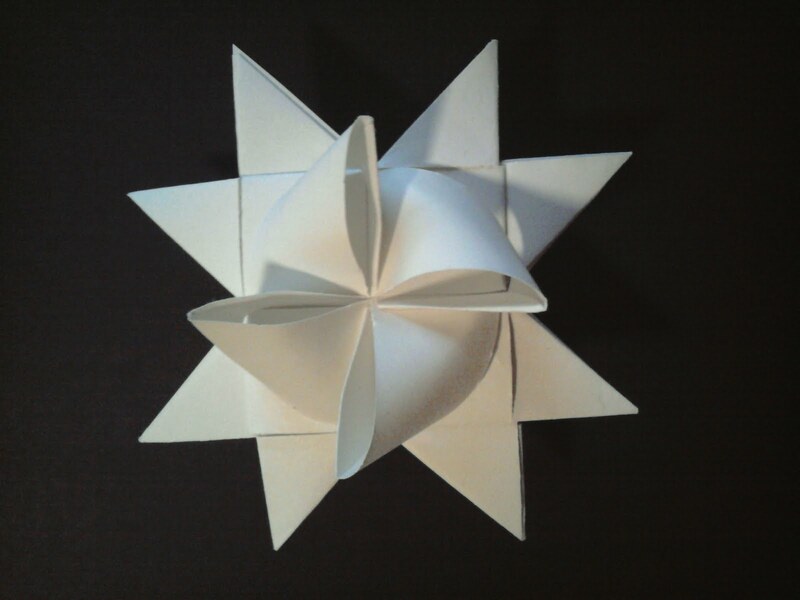 “I have now taught this for 4 guilds and people have done some really exciting work. We cover the basics of working on canvas as well as trying to draw an original abstract word painting out of people.” The cost of the workshop will be $100. and a supply fee, paid to Jacqueline of $15. This workshop will be held at the Whispering Pines apartment complex in South Bend. Sharon Esmont will be creating a map for us since this will be a new venue. Jacqueline had been to South Bend several years ago, and we welcome her back. As a guild, we have used her DVD to create and inspire us with her artwork and textures. If you are interested in attending this workshop, please contact gvanderhey@hotmail.com. 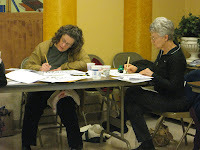 Marijo Carney will be teaching brush lettering for a one-day workshop on October 20, 2012. Please note that the date of this workshop has been changed from September due to the instructor's schedule. Cost to be announced. We almost had a brush lettering workshop with Marijo a few years ago, but, we had to cancel it, so we are pleased that Marijo will be joining us to teach brush lettering later this year. She has taught design to our guild several years ago. Welcome back, Marijo! Pen Dragons – The Pen Dragons of Kalamazoo will be hosting Pat Blair for a workshop on September 17 & 18. Check out her website to see her work. The Pen Dragons are very warm and welcoming when you are part of their workshops. They usually fill their workshops, so if you are interested in being a participant in one of their workshops, you may want to consider being a Pen Dragons member to get first dibs! Nib Tip – Here's a tip from an acrylic artist to remove dried up paint from brushes that should work on nibs, as the adhesion of acrylic ink is less on a metal nib than on brush hairs. In a Steel pot (this only works with steel ware), pour lemon juice in the pot and heat till boiling. Put in your brushes (nibs) in the pot and time them around 5 minutes. Let cool to touch and roll away the rubber (acrylic). Repeat if necessary. The chemical reaction dissolves the enzyme that bonds the two together and breaks away. We want to extend our condolences to MCG member Renee Tuveson on the loss of her father, Robert Seeley. Our thoughts and prayers are with you and your family.